Preston claimed their first home win since 16 December with a hard-fought victory over struggling Hull City. Hull took the lead when Jarrod Bowen's effort from Jackson Irvine's pass deflected past Declan Rudd. The hosts levelled through Greg Cunningham's header, before Alan Browne scored their second from the spot after Fraizer Campbell fouled Billy Bodin. Callum Robinson was denied by Allan McGregor as Preston continued to push, with Hull unable to threaten late on. The result extended a miserable history at Deepdale for the Tigers, who have now lost 21 of their 27 league visits to Preston. City have not won an away league game since a 1-0 victory at Barnsley on 21 October, with their latest failure keeping them in the relegation zone. 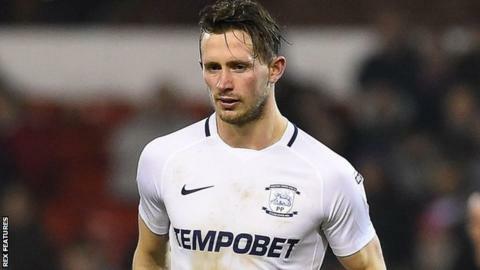 Preston, who sold Jordan Hugill to West Ham on deadline day, have won both of their two fixtures without their former star striker in the line-up, with former Bristol Rovers forward Bodin again influential. Alex Neil's side remain just three points outside the play-off places after only their third victory in 11 home games. "I think at this stage of the season, I said this to the lads, winning the game is more important than performances at times. "You can play really well but, if you don't get anything at the end of it, it doesn't really matter. Points are the prizes just now. "We didn't start the game well, I think it took us 15 minutes to understand the what the game was about. "We conceded the first goal, it was quite fortunate, it looped into the net. Lesser teams give up to an extent, but we didn't do that, we put our foot to the gas and managed to get two goals." "Against a good Preston side, we've come away from home, started well, nullified a lot of strengths they have, put the ball in right areas and scored a great goal. "The big turning point for me is just before half-time, the referee wrongly gives the decision to award a penalty. "It's not a penalty and the linesman is closest to it. It's hard for the referee to see it, so how can you give the decision? "The linesman believes it's not a penalty, the referee's not even spoke to him. For me, it's changed the whole complexion of the game." Match ends, Preston North End 2, Hull City 1. Second Half ends, Preston North End 2, Hull City 1. Max Clark (Hull City) is shown the yellow card for a bad foul. Billy Bodin (Preston North End) wins a free kick in the defensive half. Foul by Max Clark (Hull City). Max Clark (Hull City) wins a free kick in the defensive half. Michael Hector (Hull City) wins a free kick on the right wing. Attempt missed. Jarrod Bowen (Hull City) left footed shot from the right side of the box is close, but misses to the right. Assisted by Max Clark with a cross. Attempt missed. Alan Browne (Preston North End) right footed shot from outside the box is high and wide to the right. Louis Moult (Preston North End) wins a free kick in the defensive half. Corner, Hull City. Conceded by Darnell Fisher. Attempt blocked. Evandro (Hull City) right footed shot from the left side of the box is blocked. Assisted by Will Keane with a headed pass. Attempt blocked. Tom Barkhuizen (Preston North End) right footed shot from the centre of the box is blocked. Assisted by Darnell Fisher. Attempt missed. Will Keane (Hull City) header from the centre of the box is close, but misses to the left. Assisted by Harry Wilson with a cross following a corner. Corner, Hull City. Conceded by Tom Clarke. Substitution, Preston North End. Josh Harrop replaces Ben Pearson because of an injury. Substitution, Hull City. Will Keane replaces Nouha Dicko. Substitution, Hull City. Harry Wilson replaces Fraizer Campbell. Substitution, Hull City. Evandro replaces David Meyler. Attempt missed. Billy Bodin (Preston North End) left footed shot from outside the box misses to the left. Attempt saved. Callum Robinson (Preston North End) left footed shot from the centre of the box is saved in the bottom right corner. Assisted by Alan Browne with a cross. Corner, Hull City. Conceded by Greg Cunningham. Attempt blocked. Jarrod Bowen (Hull City) header from the centre of the box is blocked. Assisted by Max Clark with a cross.